Fortunately, the Eiger sports more moderate routes than its still-fearsome-after-all-these-years Nordwand. There are three routes which are considered to be more reasonable for mere mortals: The South Ridge, The Mittellegi Ridge and the West Flank. The Mittellegi Ridge and the South Ridge are both very fine climbs, mostly on rock, but with sections of snow and glacier as well. The West Flank is much less attractive and can be recommended only as a descent route after completing one of the other routes. On this page we describe the South Ridge route. Click here to go to the Mittellegi Ridge page.The best season for either the Mittellegi Ridge or the South ridge is mid-July through early September. 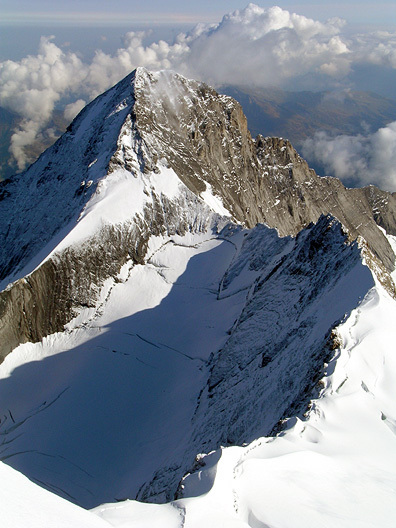 The Eiger's South Ridge is an excellent climb and the best way to climb the peak when the Mittellegi Ridge is out of condition, or if the weather forecast or energy levels are not adequate for the latter. The South Ridge is still a serious climb however, offering technical rock pitches interspersed with easier climbing and occasionally steep snow. The route is quite long taking 7 to 9 hours in ascent and another 6 or 7 hours for the descent. An early start is called for. The route is perhaps technically easier than the Mittellegi Ridge, but it is at least as long. It offers the advantage of being easier and much safer in retreat, should conditions dictate. 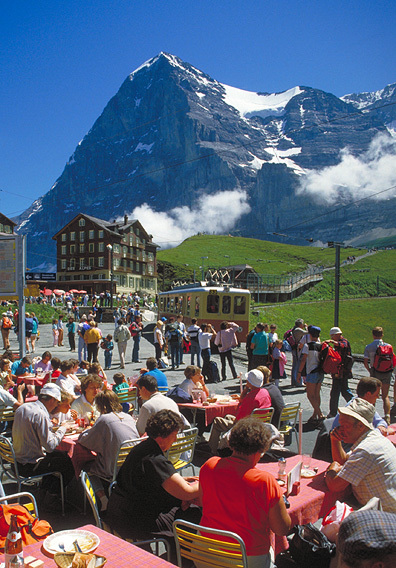 A climb of the South Ridge begins by taking the Jungfraujoch railway to its terminus. A short hike across the easy upper Jungfraufirn takes us to the Mönchsjoch Hütte where we spend the night. If time permits, we can climb one of the easier but still classic routes on the nearby Mönch on the way to the hut choosing between either the SE Ridge or the SW Ridge. The following day we start early, crossing the Ewigschneefäld, then the upper Fieschergletscher to reach the South Eigerjoch. Here the climbing gets more challenging as we follow the rocky ridge crest to the North Eigerjoch. Up until this point the rock has given us enjoyable climbing on the fine gneiss of the Mönch and the interior of the Bernese Oberland group. At the North Eigerjoch we leave the gneiss behind and cross over onto the limestone and shale of Eiger fame. Actually, the rock continues to be fairly good on the ridge crest, small hold, but lots of them. The final section of steep ridge to the summit includes several belayed pitches (rappelled on descent) and incredible views. Our descent in normally by the South Ridge as well, though we may, on occasion, elect to descend the West Flank. We finish back at the Jungfraujoch rail station for the train ride to town, a raclette and a celebratory bottle. 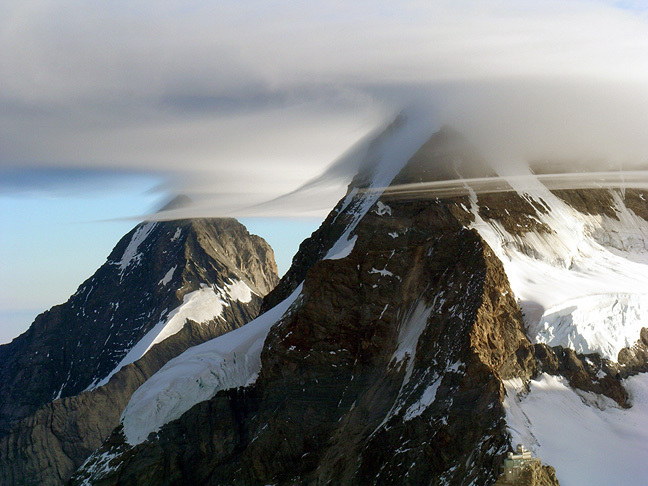 The South Ridge of the Eiger is not an easy climb. There is considerable rock, mixed with icy passages. The main challenge, however lies in the large amount of terrain that is steep and exposed, but not very difficult. All of this ground requires care, but also an ability to move quickly over it, otherwise the climb is too long to complete in a day. Add to this the great length of the climb and we have a route that is suitable only for experienced climbers. Climbers need to be comfortable climbing mid-5th class rock in mountaineering boots, and confident and skilled on very exposed ridge crests. Solid French technique cramponing skills are required.